Secluded Chapel Cabin. Our Coziest Cabin Available! With Indoor Jacuzzi. Sits on Over 4 Acres of Privacy. Log Heaven is located only 5 miles from HELEN, GA on the backside off of Alt 75. This AUTHENTIC log cabin provides the best in CONVENIENCE and LUXURY. Recently updated with a brand new back deck that is to die for! Relax on the back deck and enjoy the peaceful mountain view. It has a NEW gas Grill, a NEW gas Fire-pit, and NEW porch furniture and New BEDS. 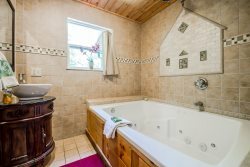 It has a HOT TUB that over looks the property. FREE wifi, a gas fireplace in the living room all in a very PRIVATE setting. Whether you’re soaking in the HOT TUB, enjoying the mountain range view, or rocking on the porch, you’re sure to fall in LOVE with LOG HEAVEN. The character and charm of this beautifully antique decorated CABIN will take you back in time -but it won’t leave you there – it has all the COMFORTS of home and then some. This Newly Remodeled, Real Log Cabin will leave you breathless and wanting to stay longer. Enjoy the private setting, and all the nearby trails for hiking & biking. Horseback Riding is only 12 minutes away, which is always fun for the whole family. Downtown Helen is close by with all of its charming shops and excellent international restaurants. Dist. from Helen: 10 min. Dist. from Office: 15 min. Dist. from Trout Pond & Blue Creek: 15 min. Yes, 100%! All transactions take place through SSL secure channels. We don’t store credit card data and will never share or sell personal or financial information with or to any third party organizations. Upon completing the payment, we will email a receipt to you and a copy of the Blue Creek Cabins rental terms and conditions. Complete your rental agreement, by reading and signing and returning it to [email protected] with a clear copy of your drivers license. Fourteen days before your scheduled arrival date your final payment is due. Before charging your card we will call you. After the final payment is made, we will send you our welcome package which contains the driving directions, lock box key code and other details about getting TO and IN your cabin. CAN I CHANGE OR CANCEL? Yes, up to fourteen days prior to your scheduled arrival, you can cancel your reservation with a $50 transaction cost or change one time with no fee. Canceling thirteen days or less from your arrival date is considered last minute cancelation and forfeiture of all monies. ECP (Emergency Cancelation Policy) is always an option but must be purchased at the time of your reservation and is NON-Refundable.